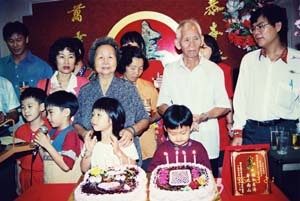 Birthday joy: Sue Yong celebrating his 80th birthday with his wife Swee Mei (on his left), children and grandchildren. While most fathers will be spending quality time with their children on Father’s Day, there is a minority who will be looking for their children who have gone missing, and there will also be children looking for their fathers. Sunday Star speaks to some of these people who still hope to find their loved ones. IT has been seven years since Tan Sue Yong went missing but his grandson Joel Tan still has hopes of seeing him again. Sue Yong, who was 83 and suffering from dementia, left his home in Yong Peng, Johor, for his daily morning walk never to return. “We pray to God that he would one day bring him back alive. And we are still clinging on to that continually fading hope,” said the 15-year-old, who added that his grandfather was a good cook, among other things. Joel still remembers the day his grandfather went missing. “Although I was a young boy then, I could feel the tension in my family. I could see the agony on my parents’ faces as they went around looking for him, going around and around the same route that my granddad used to take when he visited his rubber estate,” said Joel. The strong feelings for Sue Yong still exist, and every year on the date of his disappearance (May 23), special prayers for his well-being are held. “Even now, tears still trickle down our cheeks whenever we think of him because we know that we have lost a great man in our family,” said Joel. According to Joel, his grandfather cared very much for him and his siblings. “Whenever my dad scolded or wanted to cane my siblings and me when we were younger, we could always count on him to help us out. We would always hide behind him for we knew that he would be there to protect and defend us,” said Joel. Joel’s father, Roger Tan, 45, believes his father has passed on but he has not completely given up on finding him. “Unless he is being taken care of, he must have passed on. I still carry the hope that he is alive. Even if he is dead, I hope that we can find him and give him a decent burial,” he said.